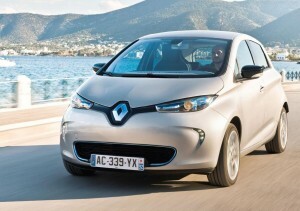 New Renault Zoe 2013: Cheapest Electric Car Yet? On the surface the Renault Zoe looks like a game changer for those wanting to buy an electric car for everyday use – and it is. And isn’t. The Renault Zoe range starts at £13,995 which is cheap for what the car offers. Though it’s cheap for a reason – the batteries aren’t included. Anyone buying a Renault Zoe will have to lease the batteries for £70 a month. That’s OK but the price for leasing is £840 a month and the car will be suitable for anyone not doing more than 7,500 miles a year. However, Renault is throwing in a free charging zone which is worth £500. Before going on to the spec for the Renault Zoe, and there are some impressive ‘firsts’, can I just flag up that there are some impressive diesel engine cars out today which will bring 80+ mpg. The Renault Clio Eco2, for instance, will take the 45 litre tank for 795 miles and 88 mpg. At current fuel prices the buyer would save around £200 by not leasing the batteries. The motoring costs of electric cars are still their biggest handicap but they are, undoubtedly, going to be more popular in the future. The Renault Zoe is the first production electric vehicle to break the sub-£14,000 bracket (after Renault’s incentive and battery rental). It’s also the first production electric vehicle with a range homologated at over 130 miles and can cover between 62 and 93 miles depending on driving style and weather conditions – as such the Renault Zoe has the longest range in its category. Charging takes between 30 minutes and nine hours depending on the power of the charging station (between 3 and 43 kW), from just one socket, thanks to the Chameleon charger though the Renault Zoe can be fast charged – 80% of the battery in 30 minutes. The Renault Zoe is a bold bid by Renault on several fronts and deserves to do well though I’d be tempted to check the potential leasing prices which may go a long way in mitigating the car’s running costs rather than buying one. This entry was posted in Car Updates & Releases, Electric Cars, Low Emissions Cars, Small Car and tagged car, City Car, Clio, Compact Car, diesel engine, eco car, electric car, electric cars, fuel prices, Hatchback, LS, mini, MoT, New Renault Zoe, OK, price, Renault Zoe, Renault Zoe 2013, Renault Zoe Batteries, Renault Zoe eco car, Renault Zoe Electric Car, Renault Zoe EV, Renault Zoe MPG, Renault Zoe price, Renault Zoe Range, Small Car, zoe by Steve Lumley. Bookmark the permalink.